This technique is used to diagnose clinically significant coronary artery disease (CAD) which causes ischemia, and to determine the likelihood of an ischemic cardiac event occurring in the future (i.e., prognosis). Although LV myocardial activity is generally uniform in a "normal perfusion" study, there may be perceptibly increased activity in the anterior and lateral myocardium because of more photons reaching the detector versus from the rest of the LV myocardium. To standardize the reporting of abnormal findings in LV myocardial segments on tomographic modalities such as myocardial perfusion SPECT, cardiac PET, coronary angiography CT, and cardiac MRI, professional societies including the American Heart Association have endorsed the 17-segment nomenclature model, which is shown on the left. 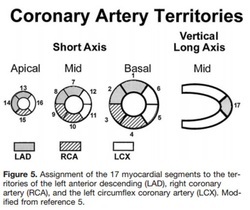 The diagram to the right shows general association between native coronary arteries and LV myocardial segments when using the 17-segment model. These associations are less reliable in patients who have had cardiac bypass graft surgery. Cerqueira MD et al. 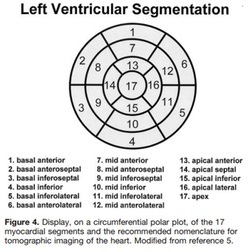 Standardized Myocardial Segmentation and Nomenclature for Tomographic Imaging of the Heart: A Statement for Healthcare Professionals From the Cardiac Imaging Committee of the Council on Clinical Cardiology of the American Heart Association. Circulation. 2002;105:539-542. Hypoperfusion of the septum/anteroseptum from left bundle branch block (LBBB) often manifests as a perfusion defect (fixed or reversible) in the septal and/or anteroseptal wall. Being heart rate-dependent, this artifact is more common when the patient's heart is "stress" by exercise (which elevates the HR) versus pharmacologic stressors. Also, septal hypokinesis or dyskinesis may be seen on gated images. 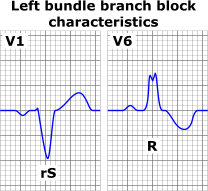 Above left are EKG findings typical of LBBB, which may manifest as notched R waves in many leads in addition to V6. This is due to the asynchronous ventricular contraction (RV first, then the LV) due to the block. Above right, the LBBB artifact can be seen in the septum. It is believed due to septal hypoperfusion during diastole (when coronary arteries fill with blood) because of the altered contraction of the septum. Burrell S and MacDonald A. Artifacts and Pitfalls in Myocardial Perfusion Imaging. J Nucl Med Technol 2006; 34:193–211. "High-risk" findings on abnormal G-SPECT MPI exams convey prognostic information, specifically an increased likelihood of adverse cardiac events above what is conveyed by the mere presence of a perfusion defect. Images of a few of the above "high-risk" findings are below.